A funny video has emerged from Greece of a dog attempting to swim in a tiny tray of water. 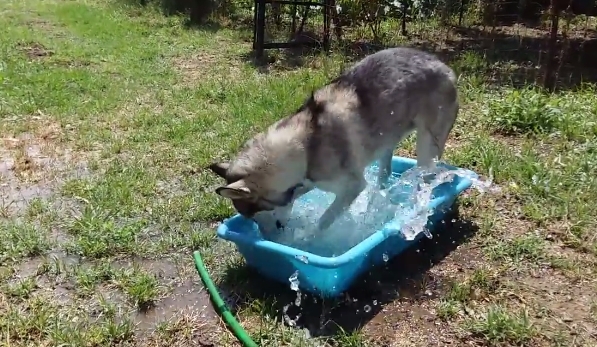 In the video, Irma the husky at first stands in the blue tray of water and then begins a vigorous doggy paddle. Needless to say, he gets nowhere fast. Did you know that animals can get heat stroke, just like people? With this summers record temperatures, it’s an even greater risk than usual. Keep plenty of water available for your pet at all times. Make sure the water is cool and fresh, and keep it in the shade. Put out multiple bowls of water on really hot days. Use bowls that can’t be tipped, and place them in a shady and (relatively!) cool spot. Help your dog cool off with a kid’s paddling pool. Put just a couple of inches of water in it, and place it in a shady location. Responses to "Husky Tries To Swim In A Tray Of Water"